When we announced Thunderbird nearly nine months ago (I’ll refrain from any “giving birth” jokes, for now anyway), it was the start of an incredible journey. At the same time, it was the last high-banked turn in a much longer journey – the realization of a decade-long dream to add a remarkable steel roller coaster to Holiday World’s line-up. 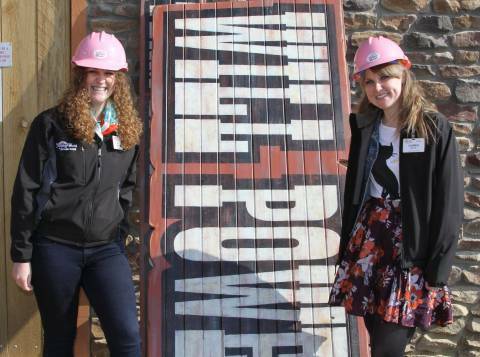 At our announcement in July, the crowd of a thousand or more made their approval known quite enthusiastically when Will’s daughters, Lauren and Leah, announced we would name Thunderbird’s “flywheel building” the Will Power building in honor of their dad, who passed away unexpectedly in 2010. That’s Leah on the left and Lauren on the right in the photo above. They want to share a bit more of their dad’s legacy, including a look at the designs he’d worked on for a steel roller coaster back in 2008. We’ll also travel back a decade for Will’s unscripted response when asked during a CoasterBuzz podcast what he would want his legacy to be. Will always got a big kick out of replacing our test dummies for the first live test rides of any new roller coaster, water coaster – or, really, any ride at all. 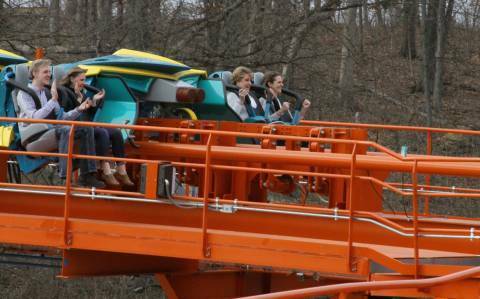 And so, when son and namesake William was available to dash home from his university studies on a recent day, the family took their first ride on Thunderbird. It was a glorious day, as the sun was setting and Thunderbird launched into the sky over and over. In the picture above, we see William, Lauren, mom Lori, and Leah as they complete their first flight together. Who put these onions here? My eyes are watering. Amazing post, and amazing video. Honestly, it’s clearly visible that The park Is in the best hands possible. Makes me miss seeing Will. Truly an inspiring man. Yes, what a great legacy and a great man! He is looking down and smilling I am sure! You sure know how to make a grown man cry first thing Friday morning! What a beautiful story and may you all have a great year with your new sibling. I wish I could ride it, but for medical reasons (I have a defibrillator) I am not allowed. SO, on that note, Happy Friday and cheers to a great 2015 and Thunderbird! Glad to see my photo of Will being so proudly displayed in the video, it still makes me smile and remember asking him to pose with his new “then” new ride! It’s a wonderful photo – that was a wonderful day. I’m sure your Thunderbird opening was wonderful, yet probably bittersweet as well. Great achievement! I hope to get back next year.